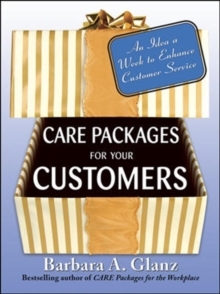 'Implementing the ideas in this book will dramatically improve the performance of your staff. More important, you'll find new meaning in your own work as a manager' - Ken Blanchard, bestselling author of "The One Minute Manager". 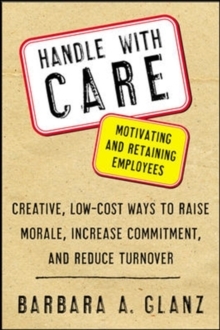 '"Motivating and Retaining Employees - Handle with CARE" is an excellent resource that encourages supervisors and managers to re-create their management style. 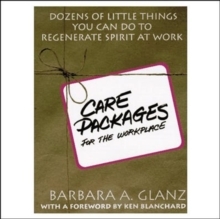 Barbara Glanz offers imaginative and fun ideas that will improve employee relations and increase productivity' - Jack Canfield, co-author, "Chicken Soup for the Soul at Work".Study after study has shown that companies who truly respect and listen to their employees get dramatically better performance from them. But the same studies reveal a chasm between what supervisors think their employees want - and what employees really want. "Handle with CARE" builds on author Barbara Glanz's C.A.R.E. model of employee motivation to help you understand what your employees really want from their jobs. 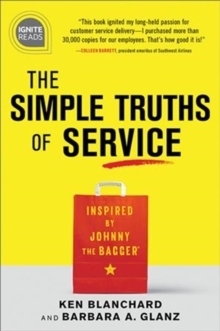 Filled with practical and proven ideas for engaging and motivating employees, and backed by an in-depth research study of over 1,200 workers, this creative book of ideas features: hundreds of tips for making employees want to do their best work for you; tools for reducing dissatisfaction and turnover; and, real world examples from KFC, Domino's, Nationwide Insurance, and other successful employers.A healthy supervisor/employee relationship is key to the satisfaction, performance, and retention of each of your employees. "Handle with CARE" explains how to create relationships that are supportive instead of intimidating, caring instead of cutthroat, and profitable on every level.